They say a journey of a thousand miles begins with a single step. Sometimes the reason the the journey takes so long is you forget the goal and do not take the time to complete the journey. One of the perpetual hazards of living in tourist destinations is never taking the time to see the sites. I grew up living this daily conundrum. I lived an hours drive from the Colorado river and the Grand Canyon and I never did see it. How often do you visit the tourist attractions in a town where you live? I have lived in Thailand for three and a half years, Pattaya for a year and a half thus far. 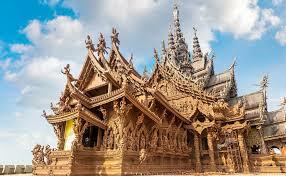 Pattaya definitely qualifies as a tourist destination and the Sanctuary of Truth is a very popular tourist destination. So much so that on my first trip to Pattaya in 2012 I looked up things to do and was immediately enchanted by the idea of visiting the Sanctuary built by an eccentric millionaire. In complete Rhiannon fashion I didn’t make it. I got a tattoo instead and visited a Go Go bar. Here I am three years later writing for the Pattaya Trader Magazine and I get an assignment to write about the Sanctuary of Truth. Now I have to go and see this place I have been meaning to experience for years. It is a cloudy overcast day with the constant threat of rain. The sky is spitting at me on the way there. The signs are confusing, GPS will lose signal nearby and if you are like me at all you will lap the place several times before finally figuring it out.There is a Family Mart outside the entrance with an ATM machine. I grab 900 baht, my self imposed limit for the day. I love to buy stuff and had I been in shopping mode there would have been many things I would have loved to take home with me. Namely one of the hand carved elephants, and a photo of myself in traditional Thai Dancing garb while seated on a throne. This was my favorite professional photo opp but there were many others to suit all kinds of tastes. Once I made it to the correct location I found the ticketing booth easy enough, there are signs in multiple languages directing visitors to buy a ticket prior to entrance. The entrance fee is 500 baht and there are many different ad for activities you can purchase at the gate or later while you are inside. I opted to just gain entrance to the attraction rather than spend much more of my budget prior to going inside. The price for buying tickets online is 450 for adults – a 50 baht discount. The other activities include elephant trekking, horseback riding, speed boat transfer to various locations, horse carriage rides and rowing a boat to feed the sharks. The speedboat transport option is pretty cool and if I had money to burn or was trying to impress a date I would totally do it. You can travel by speedboat from the Sanctuary of Truth to the Garden Beach Resort, Dusit Resort,South Pattaya Pier, Pattaya Park Beach Resort, or the Grand Jomtien Hotel. Rates range from 1200 baht to 3000 baht depending on distance. That would be a really fun activity after spending most of the day on the grounds, checking out all the activities available, watching the afternoon dance at 15:30 and then taking a speedboat off to your next destination. For the ultimate day I think I would cruise by speedboat to the Pattaya Pier and board the Admirillica for a sunset pirate cruise, but I digress. There are also different activities for the kids, such as feeding horses, feeding fish, and a restaurant overlooking the living art that is the temple. A couple of rope bridges, and I mean the real deal. It was all I could do to stay off the stuff. I went on a cloudy crumby day and there were very few people around and the naughty devil on my right was trying to get me to do all kinds of unauthorized climbing but since I was researching for work I refrained. As you continue on your walk toward the temple itself there are plenty of places for killer selfies and group shots. There are professional photographers available for posed shots and rates are reasonable. Some say the 500 baht fee, which by the way is the same whether you are foreign or Thai, (children under 12 are half price), is exorbitant. I disagree, the delicacy of the carvings paired with the close proximity granted to visitors warrants the fee. They need to keep numbers controlled, imagine huge tour buses descending on the temple. If it were 50 baht, the place would get destroyed. The constant exposure to the elements causes the temple to be in a constant evolving state of repair. The wind, the water, the salt, and the sun, all four elements the temple is built to honor will be its very demise if the army of Thai carvers ever cease working. Although this near tragedy could cause some worry it actually fits with the feeling of this magnificent temple by the sea. As you explore there are signs explaining karma, and the cycle of life and the very temple itself is a living example of this cycle. The Naklua Kitchen that overlooks the building site is a great place to stop for a quick bite, a cup of tea, or a cigarette. There is no smoking on the site itself but there are plenty of spots cleared away. Just passed the restaurant is a little souvenir shop and a wooden staircase descending the hill through the jungle on the way down to the site of the carved wooden temple. Grab a hold of the rope railing and watch your step, as you can imagine the steps are anything but even. The wooden steps definitely add to the sense of adventure. Once you get to the bottom there is a booth off to the right passing out hard hats, which are required apparel while on the site. At the booth there are also a number of guides to assist in many different languages or you have the option to just explore. Since I had already done extensive online research and knew the story of the temple I wanted to just explore on my own. As I approached the temple the first thing I noticed was the state of the carvings. Some were varnished, some were worn away and weather damaged, while others were new boards with nothing more than a drawing stenciled in or with just a number awaiting a stencil drawing to begin the process. Seeing the different stages right next to each other after reading about it really brings to life the never ending cycle this temple goes through just to be. It also causes every visit to be unique. There is no way the temple is ever the same twice for any visitor. The next thing I noticed was that even the platform foundation the temple is on is made of wood and rocks. There is no concrete. As I continued around admiring the artwork I was continually amazed at the amount of detail in the art work. When I got around the north side of the temple I was immediately torn on which way to go, I could continue out to the coast where there was a new looking, small building under construction or I could go up into the temple with the other tourists. Not wanting to miss anything I continued out to the point. In between the temple and the new little building where there was a tropical garden with little places to sneak a shady spot to sit on a sunny day. I got to the little building and there was a ladder leading up to the roof, where there was clearly a lot of work being done.I was alone and unsupervised with a ladder and a building overlooking the crashing sea. Tropical Storm Vamco was giving Pattaya Bay waves up to 3 meters and I climbed up on the wall to discover a stairway leading down to the sea from this lovely little building. The surf was crashing and there was no way I was going down there, but I caught some killer video that you can see on the Trader Facebook page. I then headed toward the temple itself to ascend the steps inside. There is an elevator lift encased in glass and carved with the same detail as everything else so the temple is accessible to all. Once inside I looked up in the center room at the carvings that stretch from floor to ceiling lit up with golden lights and it literally took my breath away. I had to keep looking up and the peace that washed over me while admiring this type of artwork on this scale was moving to say the least. Do so right now, if not sooner. Don’t wait, just do it, go and enjoy it. I did.